NAMM 2013: Zildjian has plenty to celebrate at NAMM 2013 as this year marks their 390th anniversary - and they're marking the occasion with all kinds of new gear. Up first, we have an updated Gen16 system. The acoustic electronic cymbals now boast a direct source pickup, with packs featuring up to five cymbals and pickups shipping from June. 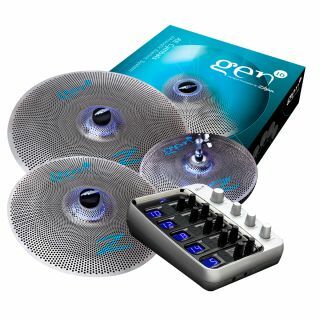 The cymbal giant is also introducing new sizes and a fresh look for its ZBT range in 2013, while six special 390th anniversary cymbal packs are on the way. The packs will cover lines for K Custom Hybrid, K, A, ZHT, ZBT and ZBT X cymbals. Meanwhile, the iconic A line is also in on the action, with adjustments made to the weights and curvature of the range, creating an exciting new sound. Plus, a handful of sizes have been added to the Zildjian A catalogue, including the 23" A Sweet Ride. Finally, if any drummer deserved a signature stick, it's Ringo Starr. The Beatle gets his own 5A stick with an elongated oval tip and purple dip coating. For more head to www.zildjian.com.